Have a question about one of our Rock Stars® or about rock gardening in general? We're always happy to help. But we might already have the answer. Scroll through theses Q & A's first. 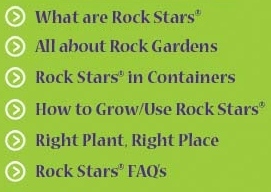 How do I choose the right Rock Stars® plants for my garden? We suggest trying out the various Advanced Search options on our site. These allow you to set different criteria that describe the conditions in your garden (such as light exposure and soil conditions) then our search matches these up with plants that will adapt to what you have. Our search also allows you to specify various uses for the plants (such as growing in containers or walls) various characteristics (flower or foliage colour, for instance) and many other things too. I don't know what hardiness Zone I live in. How do I find this out? Because Rock Stars® are sold in both the USA and Canada, we have opted to make use of only one hardiness zone rating system to keep things simple, and that is created by the United States Department of Agriculture. If you live within the USA, head to the U.S. National Arboretum website where you will find a clickable map to zoom in on your region. At the National Arborday website you can also search for your USDA Zone by zip code. We express zones by their range, for example we may rate a Rock Star® as being suitable for Zones 4 to 9. If you live in Zone 5 then you fall within that range and the plant should survive in your garden. If you live in Zone 2, you are below the range and the plant may not survive the winter. The Agriculture Canada Plant Hardiness Zones are different from the USDA Zones. Canadians can use this temperature chart to figure out their USDA Zone. Are there any Rock Stars® that will grow in the shade? Yes, there are a few kinds that will tolerate or even prefer bright shade, but very few Rock Stars® will enjoy the deep all-day shade like you might find under evergreen trees or large maples. Try using our Advanced Search feature and set the Sun Exposure to match what you have available. The search will return a list of potential Rock Stars® for you to consider. In very deep shade you might have better success growing various groundcovers such as Periwinkle (Vinca minor), Japanese Spurge (Pachysandra terminalis), Barrenwort (Epimedium), Lily-of-the-Valley (Convallaria majalis), Creeping Lamium (Lamium maculatum) or Bigroot Cranesbill (Geranium macrorrhizum). These and others may be found on our Heritage Perennials and Jeepers Creepers websites. I find that rocks are expensive and beyond my ability to move easily. Do I really need rocks to grow Rock Stars®? Not at all. If you take a look at our various Rock Garden Styles you'll find that gravel gardens are a great alternative, providing a good environment for Rock Stars® without using any large rocks at all, if you wish. Also, alpine troughs and other types of containers let you grow these plants in the easiest possible way, even if you happen to only have a balcony or deck. Building an alpine container garden is a fast and easy project that you can easily complete in a weekend. I love these Rock Stars®!! Can I order plants directly from you? We don't ship or sell plants directly to home gardeners, and Rock Stars® are not available through this web site or by mail order at the moment. But check our Retailer Locator and hopefully from our many Dealers you can locate one near where you live. Our Dealer list is expanding quickly, so our Rock Stars® should be more widely available shortly. I'm thinking of taking out my entire front lawn and converting the area to Rock Stars®. Do you have any suggestions? Absolutely. Start small. First build a little rock garden in a highly visible part of your garden, somewhere that you see easily and can enjoy regularly, perhaps along your route from the front door to your car. Live with this for a year or two, and get a feel for how it looks and the kinds of tasks and maintenance that are involved. While your entire front yard might look fantastic done up as a rock garden, building a large garden is a huge task and the ongoing maintenance might not fit your lifestyle. So start out small, you can always expand later. I've got a very sunny area that gets hot and dry. Are all of your Rock Stars® drought tolerant? A good many of them will tolerate drought conditions once established. Try using our Advanced Search feature and set the Sun Exposure to Full Sun and the Soil Moisture to Dry. The search will return a list of potential Rock Stars® for you to consider. Bear in mind that for the first month or so your Rock Stars® will need to be watered about twice a week, and more often if you plant during the heat of summer. Gradually cut this back to once a week, but watch for signs of wilting plants and water them as soon as you can. By the second season you may only need to water during extended periods of drought. Deer and rabbits are both a big problem in my neighbourhood – they seem to eat everything! Are there any Rock Stars® that I could try? For sure there are. We've spent a lot of time researching deer and rabbit resistance, and both these are attributes you can select when using our Advanced Search feature. One thing to keep in mind though: when populations are high and food is scarce, critters will eat or at least sample almost anything. Local populations sometimes develop a taste for certain plants that deer or rabbits in other regions don't touch at all. In other words, no list of deer or rabbit resistant plants is foolproof, but it offers a good starting point. Can I plant Rock Stars® after the spring? You sure can. Just like with all container-grown perennials, planting after the traditional spring planting season works very well. During the heat of summer you may have to water new plantings more regularly, and a good starting point is three times a week for the first month, tapering this gradually back to twice a week or less, depending on the natural rainfall. Alpine troughs and other containers rely totally on you for water, so you will always have to water these regularly. How often is hard to say, it depends on the amount of hot weather, size of the container and the material it is made from. We advise poking your finger down under the gravel a couple of inches to see if the soil feels moist or dry, and to always watch for signs of wilting plants. Fall planting can also work very well. As a rough guide, aim to plant your Rock Stars® at least six weeks before the soil in your region freezes hard for the winter. I've heard you should mulch your perennials for the winter. Should I be doing this with my Rock Stars®? We don't recommend a special winter mulch. Many of our Rock Stars® are evergreen in habit, and a thick layer of leaves or straw could easily lead to rotting during the damp winter and spring months. Organic mulch nearly always holds moisture around the crown of the plant, and most alpines hate this. The only mulch we suggest using with Rock Stars® is an inch or two of gravel, applied right after planting. © 2019 Valleybrook International Ventures Inc.